It seems like the best way to describe life these days, at least for a lot of people, is "intense". I keep hearing that word applied to situations. I've used it myself more than a couple of times. But even as we say it, we insert a pause as though searching for a better word. It seems even "intense" isn't quite the right fit- just the best, or only word, we can think of that even comes close. Nature seems to be keeping pace, or perhaps driving this pace, with "intense" events as well. 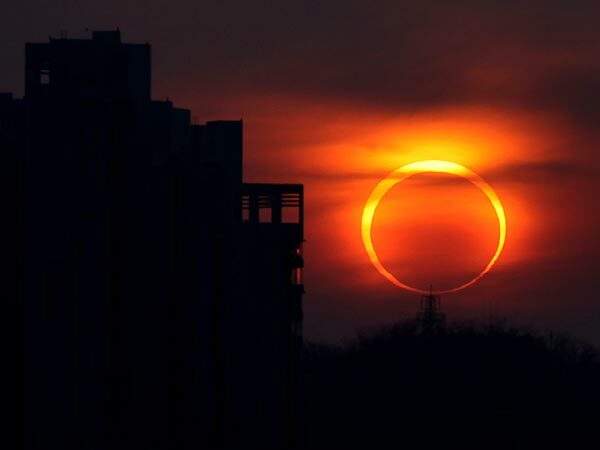 This weekend, on Sunday, there will be an Annular Solar Eclipse. It won't likely be visible in my part of the world, but throughout parts of Asia and the United States it's strong enough that you can't look at the sun directly without risking damage to your eyes. And if that's not intense enough for you there will also be solar flares occuring with increased freqency. There are many names for this type of solar event when the sun, moon and earth all line up. It is referred to as a "ring of fire" because the moon will seem smaller than the sun due to it's present orbital location, leaving a ring of sunlight around the edges of the moon. It is also referred to as a "time traveling" solar eclipse. I like that title the best. I'm not sure where that reference comes from but according to We'Moon 2012, at the same time the eclipse is happening, both the New Moon and the Sun will be in Gemini. Gemini is the shapeshifter of the air signs according to We'Moon. So all this Gemini energy suggests we might be able to slip out of one reality and into another with lightening ability. In my part of the world, this weekend is often a "travel weekend" regardless of what the sun and moon are doing. It is referred to as "the May long weekend". Officially, this is a holiday to mark Queen Victoria's birthday. Her birthday apparently is May 24th, but to make things line up nicely, the holiday is observed on the last Monday before the 24th. Seems like some "time traveling" to organize that date on weekend. In my world, the reference to the Queen is really kind of lost in preparations and activities around it just being a long weekend that really seems to celebrate summer. Unlike other holidays where people actually plan to relax and take time off, or enjoy "down time", this holiday is really about "doing". It's a date for people to travel to the cottage to clean and prepare it for the summer season. For others, it's about traveling on the first camping or canoe trip of the season. Flower and gardening stores have been "intensely" preparing for this weekend. It's time to travel to that garden store and get all the supplies you need because, all of a sudden, with wild abandon, you can put in those seedlings, plant all kinds of flowers, put in your potatoes, and sow those seeds. Whether you're building a pin hole box, traveling to the cottage to clean and set-up, or putting in a garden, it seems we are focused on "doing". I wonder if all this doing is a rather exaggerated response to match the intense action of nature. Whether it's spring buds coming out on the leaves, or the planetary line-ups, nature is pretty busy "doing". It occurs to me that we can never match that level of nature's intensity. So maybe we aren't supposed to? Maybe this is a good time to sit back and watch rather than try and join in. Maybe it's about "riding the wave" rather than fighting it, trying to power through it, or race it to the beach. We'Moon 2012 explains that an eclipse is a good time to press the "re-set button". It's about having a chance to start over. It's an opportunity to stand back and observe as things disappear. I like that idea. When my computer gets overloaded with programs, and button pressing, and too much information, it freezes and the only thing to do is press "re-set" or unplugg it. Perhaps our brains need the same re-setting. Perhaps we are all experiencing just a bit "too much". Maybe the answer isn't in loading another program or creatig more action. Maybe the answer is in pressing the re-set button. Once you press that button you have to sit back. For a second or two everything goes black. At this point I usually hold my breath, but I don't think it's necessary. It does no good to press the button a hundred times in fast succession. It doesn't help to wiggle the mouse. It's probably a good time to take a really good deep relaxing breath and wait until a new screen appears. I don't really have to do anything after I've pressed that button. In fact there is nothing I can do. Maybe the universe is pressing the re-set button for us. We have nothing to do but trust and allow the release of energy from intense times to propel us onto a new course, a new dimension, a new perspective. Maybe rather than building a pin hole box, it's about closing your eyes and feeling the transition from light to dark to light again. This is exactly what I've been feeling and have blogged about lately...you will see the latest one tonight. Too funny! A psychic friend of mine said that much of this intensity is due to Venus retrograde as well. He remarked that many of his clients were all facing similar issues, especially with respect to romance and finances. Thank goodness for the reboot of the solar eclipse! Thanks for sharing. Nice to know we are not alone. Peace and blessings.